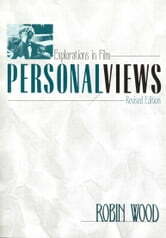 Robin Wood, the renowned scholarly critic and writer on film, has prepared a new introduction and added three essays to his classic text Personal Views. This important book contains essays on a wide range of films and filmmakers and considers questions of the nature of film criticism and the critic. Wood, the proud "unreconstructed humanist," offers in this collection persuasive arguments for the importance of art, creativity, and personal response and also demonstrates these values in his analyses. Personal Views is the only book on cinema by Wood never to have been published in the United States. It contains essays on popular Hollywood directors such as Howard Hawks, Vincente Minnelli, and Leo McCarey; as well as pieces on recognized auteurs like Max Ophuls, Orson Welles, Fritz Lang, and Josef von Sternberg; and essays on art-film icons Jean-Luc Godard, Michelangelo Antonioni, and Kenji Mizoguchi. The writings that make up Personal Views appeared duing a pivotal time in both film studies-during its academic institutionalization-and in the author's life. Throughout this period of change, Wood remained a stalwart anchor of the critical discipline, using theory without being used by it and always staying attentive to textual detail. Wood's overall critical project is to combine aesthetics and ideology in understanding films for the ultimate goal of enriching our lives individually and together. This is a major work to be read and reread not just by film scholars and students of film but by anyone with an interest in twentieth-century culture.